I am starting to dabble in the C2C crochet (Corner to Corner Crochet) projects. I think they make great designs. So of course, the first project I start off with is a Mini C2C crochet dishcloth. 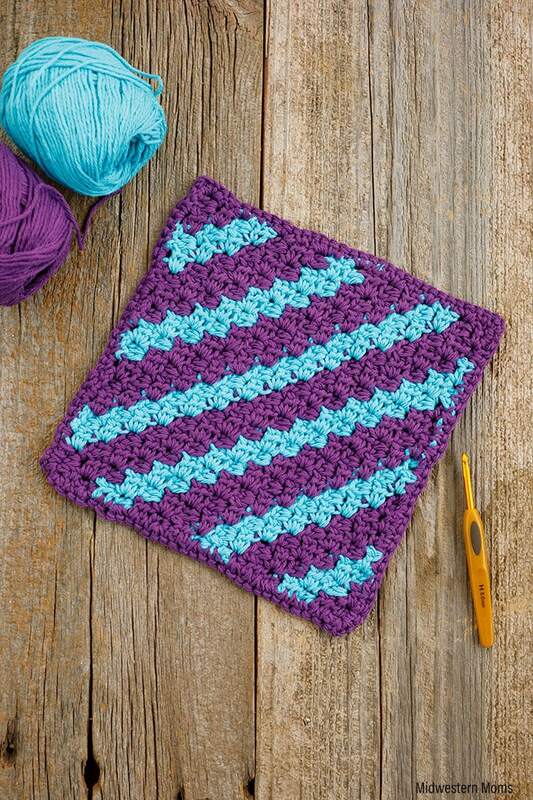 I have to admit, stripes seem to be an easy design to make but in all reality, it was a bit tough to get them to come out equal on a C2C dishcloth. 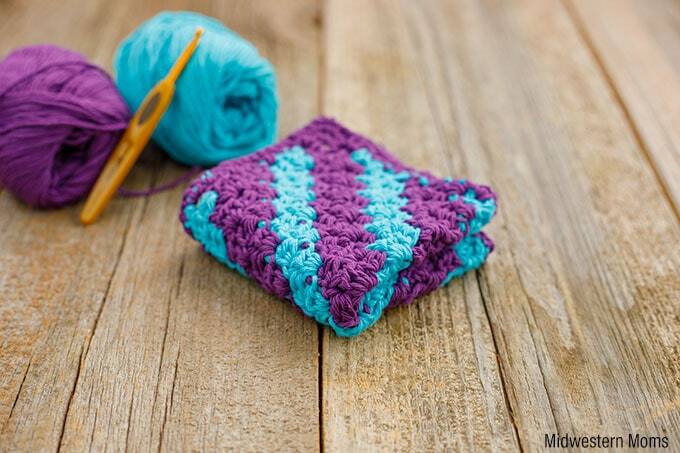 It is a small space, therefore, the mini C2C is the way to go when making a design in dishcloth form. 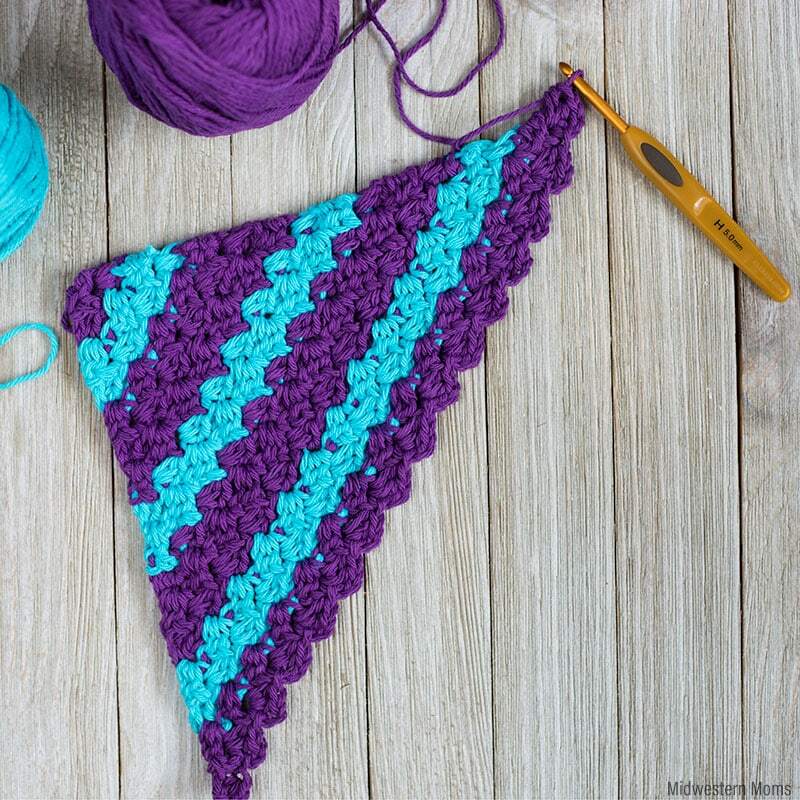 What is Mini C2C Crochet? 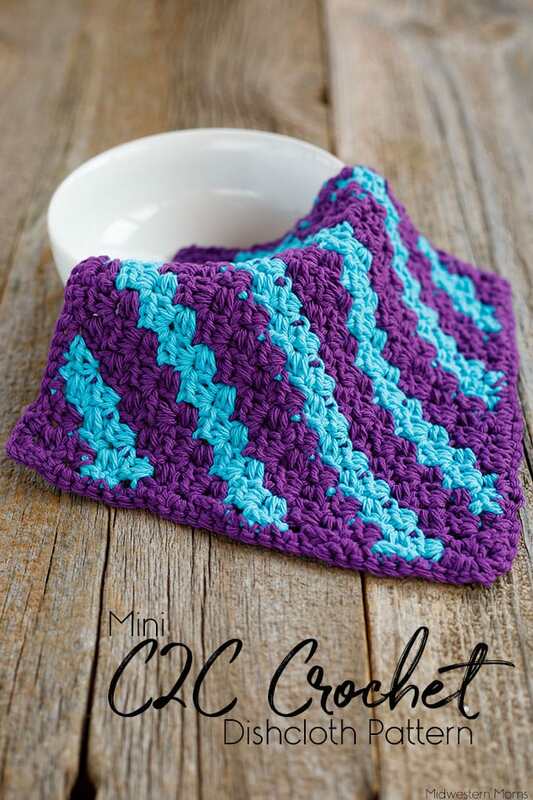 Mini C2C crochet uses half double crochet stitches instead of the double crochet stitches in the regular C2C crochet. Each box only has 2 half double crochet stitches instead of 3. The starting chains are 4 instead of 6 and you work into the second chain from the hook. So to start, you will chain 4, half double crochet into the second chain from the hook. Half double crochet into the last chain. Your first block is completed. For the second row, you will chain 4, half double crochet into the second chain from the hook. Half double crochet into the last chain. Turn the first block and slip stitch into the chain space of the first block. Chain 2 and half double crochet twice into the chain space. Now you have 2 blocks for the second row. You will repeat this increase until you reach the middle point of your project. To decrease back down, you will slip stitch into the tops of the half double crochet stitches made in the previous block. Then chain 2, and half double crochet into space like before. You will decrease every row until you get to the end. For the edging, I just single crocheted evenly around. In the corners, I single crocheted, then chained 2 and single crocheted again. I placed single crochets in the stitches and in the gaps I added 2 single crochets. To get the graph for this pattern, you will either need to sign up for my free newsletter or purchase the pattern off Etsy. Glad you like this dishcloth! I love it too. Good Luck! 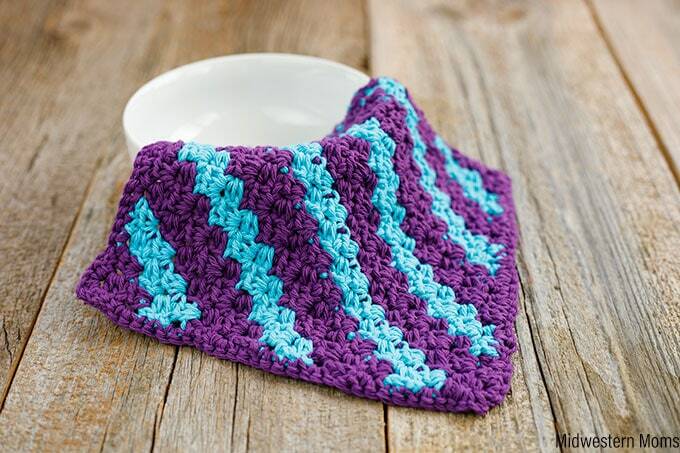 Beautiful colors in this dishcloth! Can’t wait to try the pattern! I love this pattern and can’t wait to make it but I have three Bible covers I have to make first(grandchildren requests). It’s beautiful and I’m always looking for new things to try so thank you for this wonderful pattern.